string dataPath = Application.StartupPath + @"\data\Alarm Data.data";    //Setting the data file path. //Enabling the timer for the current time. //Loading any data that might be saved. //Showing the AlarmForm dialog box. //Checking to see if the alarm exists. If not it will be added to the form. //Adding the alarm object to the list. //Making sure there is an alarm in the form to edit. //Getting the alarm enabled status. //Removing the alarm to be edited. This is so it won't think the edited alarm is a duplicate. //Checking to see if the edited alarm already exists. If so removing it and the user will have to re-add the alarm. //Removing an re-adding the edited alarm to the _alarms list and the mainform listbox. _alarms.GetAlarmsList();    //Test method call to verify the edited alarms was added to the list. Can remove later. //Checking to make sure an alarm has been selected or the listbox is populated. _alarms.DeleteAlarmFromList(alarmsListBox.SelectedIndex);    //Deleting the alarm from the list in Alarms.cs. _alarms.GetAlarmsList();    //Test method call to verify the alarm was removed from the list. Can remove later. //Saving the alarm list data. //Getting the time and changing the text on the MainForm to reflect the current time. //Calling the method to check the alarms list times. //Checking to see if an alarm should be displaying. //Un-binding and re-binding the listbox datasource. This is so the listbox can refresh itself while referencing the _alarms list. //Setting the minimum and maximum values for the hour and minute boxes. //Getting the hour and minute values from the up/down boxes. //Using the hour and minute values for DateTime. //Getting the alarm category if selected. //Checking to see if the alarm is enabled. //Creating the alarm object to be added to the list. //This is used to populate the form if the user is editing an existing alarm. //Loading the form with all the fields. //Setting the label showing that this an existing alarm to be edited. //Loading all of the data into the form. //Method to add the alarm to the _alarms list. //Method to delete the selected alarm from the list. //Method to count the number of items in the _alarms list. //Method to get an alarm from the _alarms list. //Method to get the alarm category. 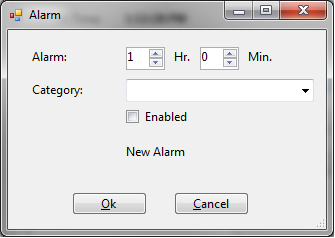 //Overload method to get the alarm category by providing the alarm time. //Method to get the alarm enabled status. //Method for searching the alarm list for a duplicate alarm. //Method to load the alarms from the file data. //Method to save the file data. //Test method used to see all the alarms in the list. Hi. Is there something missing from the MainForm.cs code? 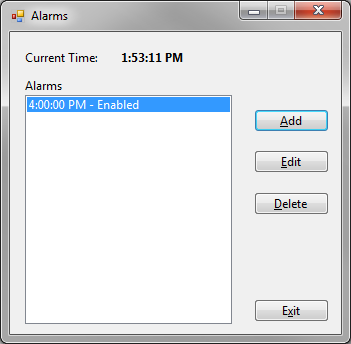 The alarmTimer does not restart (become re-enabled) after an alarm has become due and the popup alarm displayed. Hello, no nothing is missing. It was coded this way to take care of some assignment objectives. 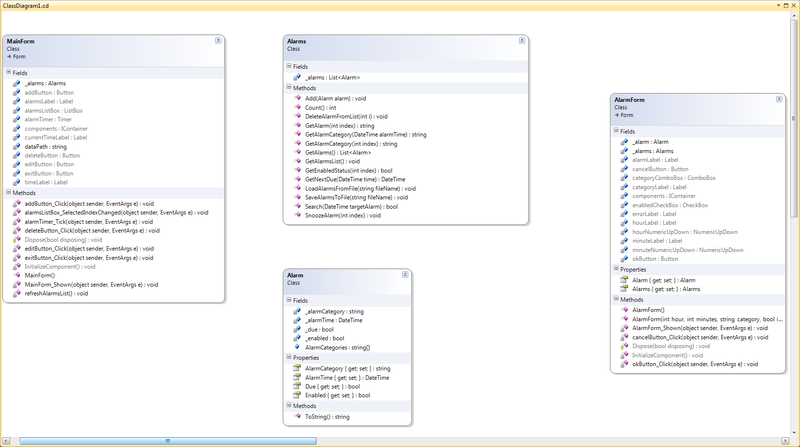 This simple workflow is something that’s on my fix-it todo list now that I’ve finished this course. 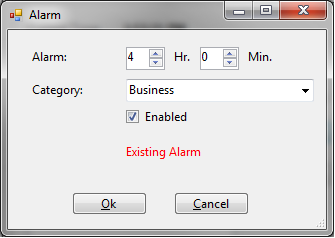 So for now the simple way is to disable the alarm then close and re-open the program.